High School textbooks don’t have anything on Asian Americans during the civil rights era. There were a lot of Asian activists in the mid to late twentieth century. All of them are not well known amongst most youth in America. So I decided to research some examples of Asian American activists. Two of the more interesting and complex figures that I had come across are Richard Aoki and Yuri Kochiyama. Richard Aoki was born in 1938 in San Leandro California as a third generation Japanese American. He spent a large part of his early life in the Topaz Internment Camp in western Utah. After the end of WWII, he and his family moved to Oakland California in a predominantly black neighborhood. As a young adult he enlisted into the army, but discharged shortly after as conflict rose in Vietnam. During his college years, he met Bobby Seale and Huey Newton. 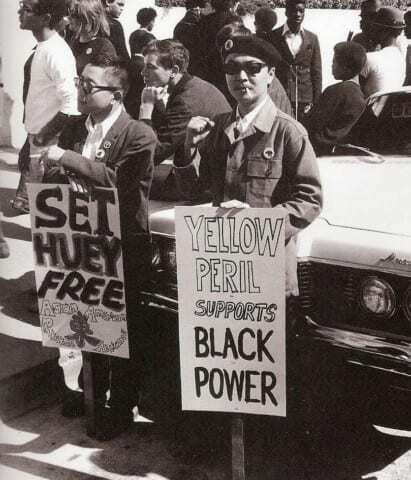 Seale and Newton would go on to form the Black Panthers Party and invited Aoki to join. As the group grew in popularity, Aoki become compelled to bring the same reform to his ethnic group and others. He separated from the Black Panthers and attended college at UC Berkeley. He would help organize many racial group for Asians, Latinos, and Native Americans. These groups would combine forces to protest at UC Berkeley for the creation of an American ethnic diversity program. In 1969, UC Berkeley gave into the demands of its students and created the Ethnic Studies Department. The department is still in effect today teaching students about the culture and perspective of minorities in America, while inspiring young adults to be loud in their political activism. Aoki would eventually become a counselor at Merrit College in California. He remained active in political and social reform until his death in 2009 at the age of 70. Yuri Kochiyama was born in San Pedro California in 1921. She was a passionate student and a gifted writer. During her time at the Jerome Arkansas Internment Camp, she encouraged Japanese women to write letters to the GI’s of the 442nd (the United States Japanese battle regiment of WWII). After the camps, she married a Japanese GI and moved to New York City. She attended ethnic group classes and participated in many protests. After being arrested in a protest in 1963, Kochiyama and her felloe protesters were taken to a courthouse to be tried and sentenced. During the court hearing, Malcolm X came by to show his support for the activists. Kochiyama met Malcolm and was invited to his office to talk about his ideas and philosophies. Kochiyama was forever changed and became good friends with Malcolm X. She lent major support for civil rights activists by hosting meetings and providing housing for some of the most important leaders of Malcolm X’s Organization of Afro-American Unity. She is famously known as the women who holds Malcolm X’s head, after he had been shot, in Life Magazines infamous photo. After the death of Malcolm X, Kochiyama went on to lead protests for African Americans, Puerto Ricans, women, and Asian Americans. She died at the ripe-old age of 93 in 2014. Today, there are not many publicly known asian american activists, nor are there Asian Americans on the level of Martin Luther King, Ceasar Chavez, or even Malcolm X. In general, Asian Americans are not represented well in media. Activists like Richard Aoki and Yuri Kochiyama should be more well known in American society and Asian people should be more active in todays landscape. My name is Keaton Yoshinaga. I am an 18 year old Japanese American from Salt Lake City, Utah. My grandmother was an internee at the Colorado Internment camp, while my grandfather was an internee at the Arkansas Camp and served in the 442nd. Growing up, I had very few asian hero’s to look up to. When it came to Civil Rights Activists, I mainly looked up to Martin Luther King. The reason why I chose more radical activists, was because I thought that it would show a very interesting and unique look at Asian American activism. There were many Asian leaders who were supporters of Martin Luther King and believed in peaceful protests (I will leave it to the reader to research them), but I thought that it was be more fascinating to shed light on the radical asian movement. I do not believe in radical protest or reform; I was simply interested in learning more about the Asian Civil Rights Movement. I hope that asian american youths (Yonsei and Gosei) across the country will take a greater role in standing up for their culture and community. I will be doing the same. Asian American Activism by Keaton is licensed under a Creative Commons Attribution-ShareAlike 4.0 International License. Keaton, this was an amazing article. I love that you are trying to bring awareness to one of the darkest moments in American history that a lot of people don’t even know about. It is sad to me that many of these very influential names of Japenese-American Activist, I have never even heard of before. I am half-japanese myself, and my Grandfather, Ted Nagata, was interned in Topaz during WWII when he was only 8 years old. I have a very real connection to this issue, and I am glad that you are trying to give justice for my grandfather and all of the other internees in the Japanese camps across America. I have found an article on the History.com website about the Japanese Internment. It has some interesting facts that I believe could help strengthen your article and also help to inform other people. Something I found on the page that fascinated me was that all 120,000 Japanese Americans that were relocated, none of them were convicted of espionage. I am glad you researched this topic and tried to shed some light on the issue. It may have happened a long time ago, but it doesn’t mean that we can still learn about it and make sure we don’t repeat history again. Thanks for writing this post on such an understated (or outright ignored) topic in American history. It’s really cool that one of the two you mentioned even pressured UC Berkely into a whole new department! I’m curious about what you think the reasons Asian-Americans aren’t well-represented in media are. I’m looking forward to reading your next post! This is really cool Keaton! I think it’s great that you’ve noticed this as well. In my AP U.S. History class last year, there was virtually no mention of Asian American activists during the Civil Rights era. I have to say that what I found most interesting in this writing is the bit about Yuri Kochiyama as “the woman who holds Malcolm X’s head”. I thought that was especially provocative because everyone knows who Malcolm X is and I myself have seen that photo and not thought twice about the others in the photo. Keep it up! I can’t wait to see where else you can take this. Keaton, I loved this article. I am an asian american myself living in Utah. Rarely do people think of my ethnic group when considering social or political activism. I admit this is the first I have ever heard of any notable again activist. I encourage you to keep focusing on this issue and maybe writing some on on going issues that effect asians across the world. Keaton, this is awesome that you wrote about this because Asian american history is very rarely talked about even today despite being a major part of our history. Aoki and Kochiyama are completely new names to me which is unfortunate, but I’m glad you are taking an active role in spreading their work. You may find it interesting to look into things like the Chinese Massacre of 1871 because that too is an event very rarely put into textbooks despite being so brutal. It’s definitely an expansive topic with a lot to uncover so I hope to see more on your views in the future.